No, I'm not talking about e4 (surprise!). In the midst of the fray I let curiosity get the better of me this afternoon. 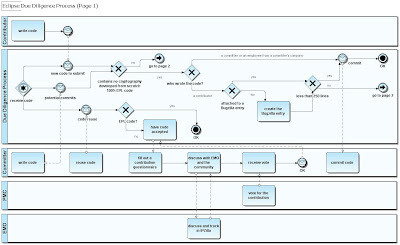 I noticed Atoine Toulme's newsgroup post about a BPMN diagram of the Eclipse legal process and wondered what the same diagram would look like if created using the free community edition of EA/Studio, Embarcadero's Eclipse-based business process modeling tool. Here's what I came up with. What was interesting to me, other than the obvious differences in appearance between two renderings of the same diagram, was that I would have chosen to draw the process differently. It reminded me of an article I read recently about the wide variation in the way different people choose to represent their processes. BPMN has indeed become the de facto standard for process model diagrams, but if everyone uses the notation in a different way, can we truly communicate our ideas using the same language? Food for thought.